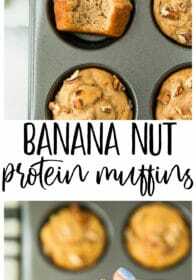 Lovely flavored Banana Nut Protein Muffins that will fill you up for hours and give you the energy to start your day right! 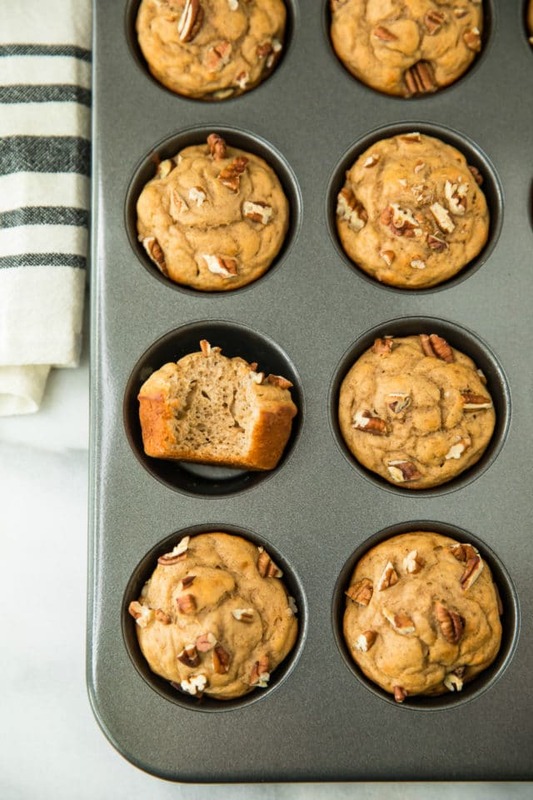 These healthy muffins pack a major protein punch and they’re loaded with warm flavors of cinnamon, banana and maple syrup. Using extra ripe bananas when baking is the BEST! 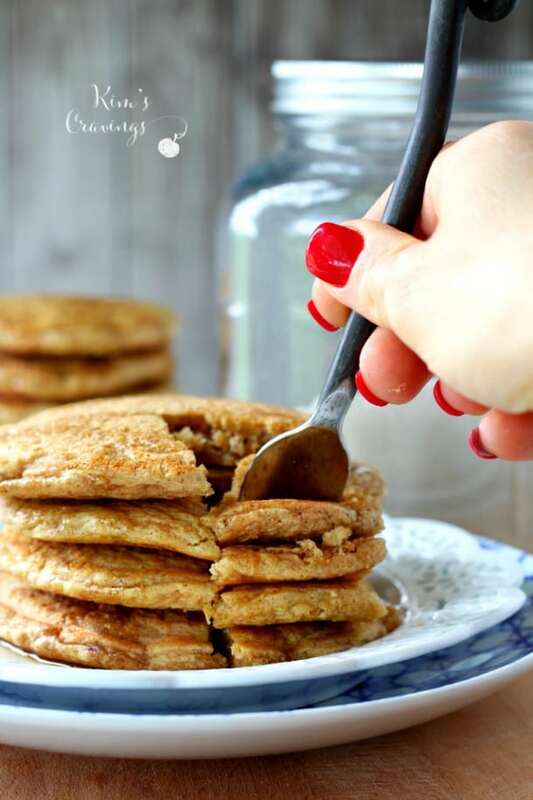 They’re naturally sweet, so you don’t have to use a huge amount of sugar in your banana recipes. Take these Banana Nut Protein Muffins – the bananas naturally sweeten the muffins and make them insanely moist without needing too much butter or oil. You can totally use a fork to mash up your bananas, but I like to add them to my blender and blend them up until they’re nice and smooth. 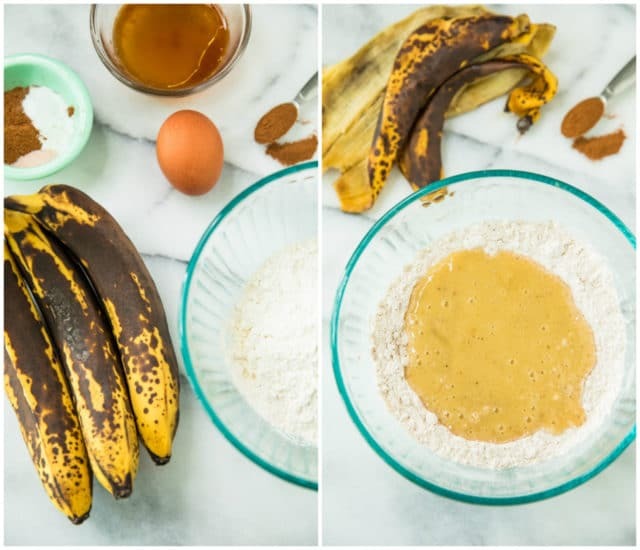 For this recipe, simply add the bananas plus the other wet ingredients to the blender and mix them all together – so easy! 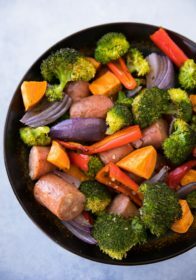 It is not a must to add cornstarch in this recipe, but it will yield the best results. Cornstarch softens the harsh proteins of flour, making a more tender baked good. My favorite muffin trick! 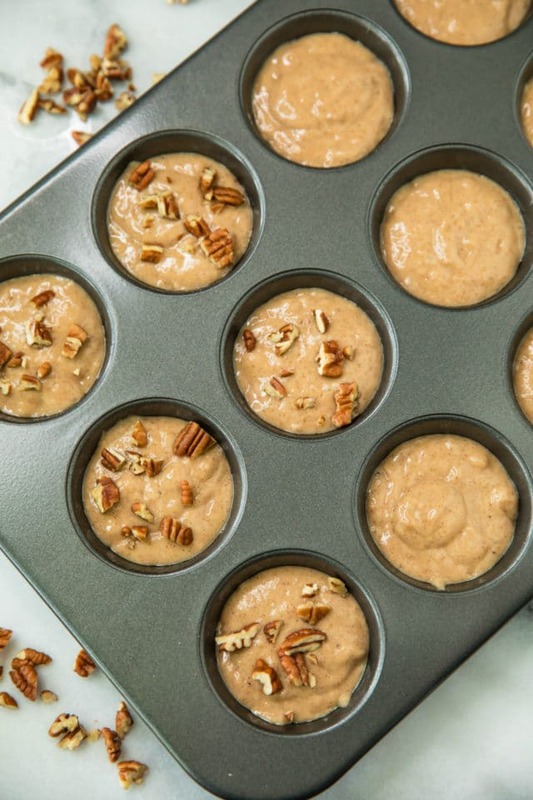 These Banana Nut Protein Muffins will rise beautifully! Start the muffins baking at a high temperature of 425 degrees F. That bit of high heat will help the tops of the muffin rise up. Then reduce the oven temperature to 350 degrees F. and cook the center of the muffin. Such a simple trick that makes such a difference to the appearance of these yummy muffins. Cutting the flour to just 1 cup and then adding 1/2 cup of protein powder, lowers the carbs and increases the protein. Use any favorite protein powder that you like to use for baking. I used IdealLean Multi-Purpose Protein. As with any banana bread-type recipe, the key is to use very ripe bananas. Like, so ripe your kids or husband or whoever is questioning your sanity in using such a nasty looking banana. The riper it is, the better your banana bread (or muffins in this case) will taste. If your bananas aren’t ripe, try this banana ripening trick. Be sure to try out some of my other favorite banana muffin recipes too! 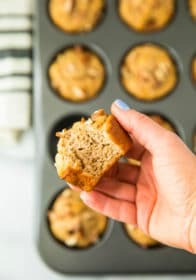 Lovely tasting banana nut protein muffins that will fill you up for hours and give you the energy to start your day right! Preheat the oven to 425 degrees F. Prepare a muffin pan with cooking spray, if needed. In a large mixing bowl, combine mashed bananas (I mashed mine in my blender) with egg, oil, maple syrup and vanilla. Stir vigorously until the mixture is smooth. In a separate bowl, combine the dry ingredients- flour, protein powder, baking powder, baking soda, salt, cinnamon and cornstarch. For best results, spoon flour into cup (rather than scooping with cup) and then level using a butter knife. Make a well in the center of the flour mixture and add wet ingredients. Gently stir until just combined. Don't overmix. Spoon batter into the prepared muffin tins filling each one completely full and top with chopped nuts. Bake muffins for 5 minutes at 425 degrees F. and then with muffins staying in the oven, reduce heat to 350 degrees F. and bake muffins for 13-15 minutes more. The high heat will cause muffins to rise and then you will lower heat to cook the center of the muffin. 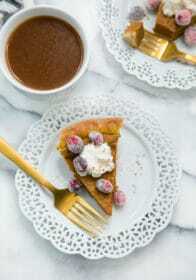 *Use an additional 1/2 cup flour, if not using protein powder. **Use any oil variety that you have on hand. I like olive oil, coconut oil or avocado oil. STORAGE: These muffins will keep at room temperature for up to 2 days, or in the refrigerator for up to 4 days. They keep well in the freezer in a freezer-safe bag for up to 3 months (just defrost individual muffins as needed). CHANGE IT UP: You could really go crazy with add-ins here. Fold in up to ¾ cup chocolate chips, fresh blueberries, diced strawberries, chopped dried cranberries and/or an additional 1/2 cup chopped pecans. SERVING SUGGESTIONS: These muffins are great on their own, with a pat of butter, or spread with almond butter or jam. 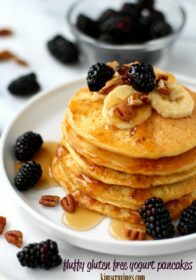 MAKE IT VEGAN: Substitute flax eggs for regular eggs and use maple syrup instead of honey. MAKE IT GLUTEN FREE: Bob’s Red Mill gluten-free all-purpose blend works well. These muffins are awesome! I like my Sun Warrior vanilla protein. In a smoothie it is a little gritty but I like the flavor. Banana Nut muffins were delicious! Just made a batch and wish I made 2! Thanks for sharing. I’m so glad you loved them! Thanks so much for your comment! These were very delicious! I mixed for two batched and was able to yield 23 muffins! You are right, they rose very well with the 425 5-minute start and cooked through with the 12-minute cook on 350. I used all purpose flour and the honey for my batch (Everything else as instructed). The kids gobbled them up! They are sweet enough to entice them to eat them, yet not overly sweet to cause a bellyache if you eat two or three, LOL! I used cupcake paper for the kids and didn’t spray with oil. You lose some of the muffin when pealing so I may try spraying with oil or just skip the paper next time. I have been buying protein bars for my kids and growing tired of spending so much money and really they sometimes cause stomach upset. 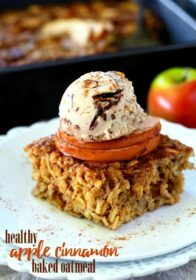 So, I am trying to find a snack to send to school with them that is homebaked and healthy. 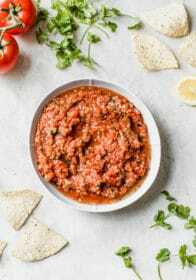 Thank you so much for sharing this wonderful recipe. All the tips really helped too! 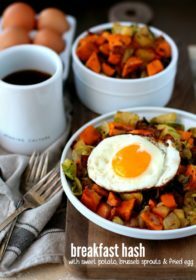 I’m thrilled that you (and the kiddos) enjoyed these muffins! 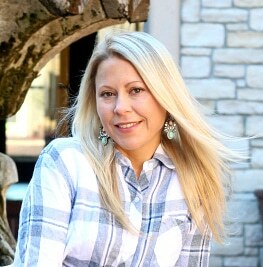 Thanks so much for your suggestions and taking time to comment! I’m just wondering about the nutritional macros on these. Can’t wait to make them! Look near the recipe ingredients and you should see the nutritional breakdown. Let me know if you have any questions about it.